I've got some good news to share! We got our letter back from Bituach Leumi (Social Security) and Tehilla was evaluated at 100% disability again! Thank G-d! It sounds crazy to be happy about such a thing but it allows Tehilla to receive many benefits both short and long term. Whew! Glad that is over. Also, our porch is completed! Construction is over and we can enjoy calm again! Well, until we take our neighbor to rabbinical court. 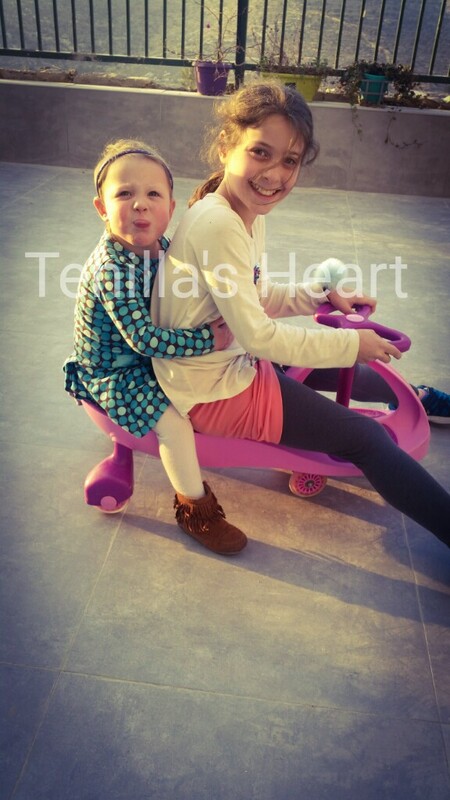 Here is a picture of our little monkey, enjoying riding around outside with Mechal. BH!! so good to hear! What a relief, Shoshana. I understand your kind of happiness. I remember the tension experienced by parents of students in my classes who were awaiting testing results. "Whew" is the operative word. As always...continued blessings from HASHEM. I have to laugh at that sassy little tongue sticking out. When I was young, I stuck my tongue out at my dad. He warned me in no uncertain terms what the punishment would be if I did it again. When he turned back to his work, I did it again behind his back. He turned around just in time to catch me in the act. Oy, I will never forget! One punishment is worth a thousand bad acts. I never did it again. Baruch HaShem that everything is working for your good . I am so very happy to hear this good news.